He there Clammers. Dropping on by for a quick run down of Roger’s lil Challenge that was added to the game for the American Dad Event. 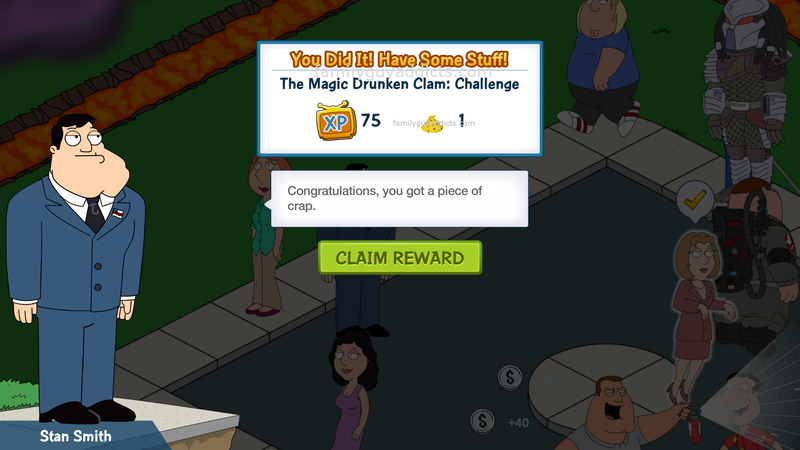 Shortly after you unlock Stan Smith during the Clam Day Catastrophe Part 3, you will see a pop up appear that will start off Roger’s Challenge. The Magic Drunken Challenge. 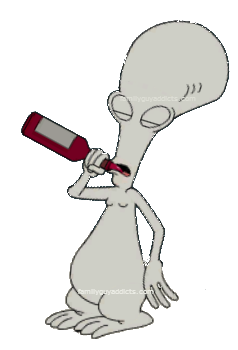 Keep an eye out on the sidewalks for Roger to appear, start drinking, and wobbling around. Or just keep an eye on Stan’s Tasks. If Roger has reappeared in town, the option to Hide Roger will be available in Stan’s Tasks. If he is currently not in town, Stan’s task to Hide Roger will be locked. Either way you do it, it will just take one hour total for Stan to complete the task to Hide Roger. Stan will find him and try to take away his drink. 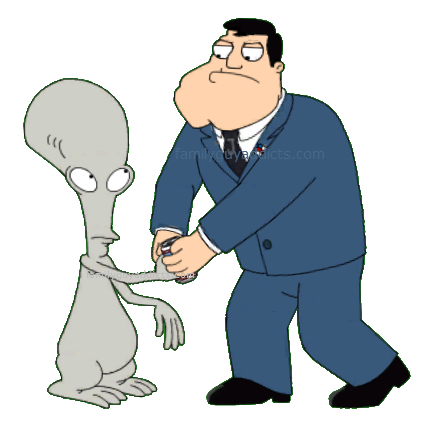 This leads Roger to slap Stan and a Slap Fight will ensue. 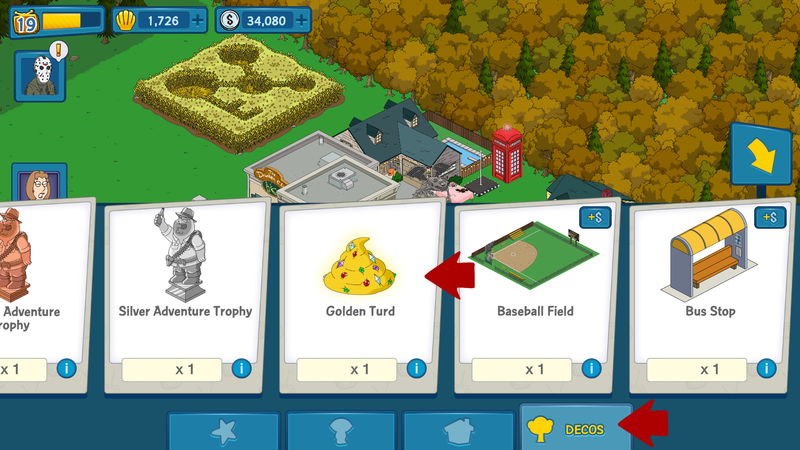 After you have completed the tasks to have Stan Hide Roger Ten times, you will win the Golden Turd. 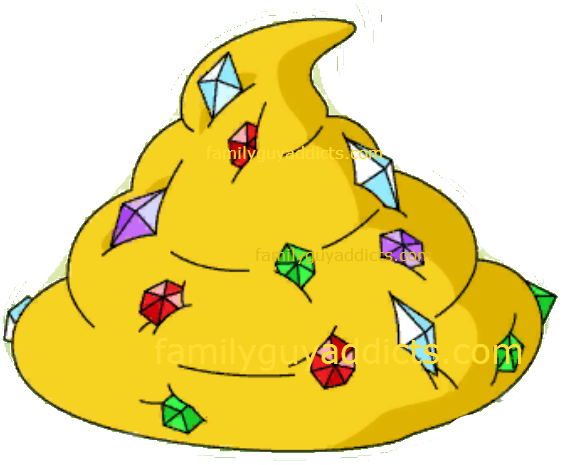 The Golden Turd will then be placed in your Inventory in the Decorations section. Just locate it to place it in your town. The Golden Turd sits on a 2×2 base. Pretty decent sized. Lol. And that pretty much wraps up the Challenge. Not too hard. Fairly simple. Ten 4hr tasks, 1hr to complete all ten of the tasks, a total of 50hrs set aside to do it in after unlocking Stan. Pretty simple. Now I am sure you are wondering, what about Roger? I want him in my game. Well no worries, there is still more coming in this fun new American Dad Event. The game gave us a lil peek at that. FYI, you will have the ability to still Hide Roger after completing this. So you can still have fun with the task. What do you think of this Challenge? Have you started it yet? Have you completed it yet? What do you think of the Golden Turd? Let us know. 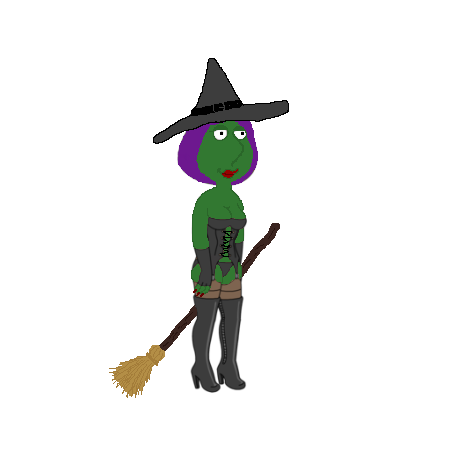 This entry was posted in Game Play and tagged American Dad Event Tips, Family Guy Addicts The Quest For Stuff, Family Guy American Dad Event, Family Guy Tips and Tricks, Giant Turd Challenge, Roger, What unlocks Roger. Bookmark the permalink. If you did not win it during the original allotted time, you may not be able to get it. As you can see…the Challenge was ONLY for the Golden Turd. NOT Roger. Roger was just a part of Stan’s task. He is NOT in the game just yet as an actual character. This is similar to Slimer and the Ghostbuster skins. Slimer was just a part of the tasks. Nothing more. Roger will be brought in as a Character later in the event. So just wait til that option is given. In the meantime you can keep sending Stan to “Hide Roger” if you want to see him. So, I wasn’t able to get the golden turd in time, but for some reason, the challenge timer reset back to 4 days. It also allowed me to keep 8/10 clearing I accumulated so far. I’m not complaining! Im at 10/11 for hide roger and now he wont respawn! Im going to be very upset if I cant get that golden turd! K, so I unlocked Stan, the Facespace icon has an exclamation mark on it, but he doesn’t appear in the list there. They are working on FaceSpace. They just reworked the Con Characters and Halloween ones back in. No worries, the Smiths will return eventually. Hi! So last night the golden turd task ended for me and unfortunately I was not able to complete it (9/10). So today I was checking my game around 1:00. And Stan had the exclamation point above his head, so I clicked and the golden turd quest popped up, giving me four days and still on 9/10. So it looks like I will get the golden turd after all, but do you know if this is a glitch or if they just gave everyone who didn’t get it a second chance? If it is a glitch…that’s pretty awesome. Lol. So I’ve got Stan out and about, I also have the Golden Turd, but Stan doesn’t appear in my “Character list” and I don’t appear to have “won” Roger. I did have a random glitch where Stans quests appeared to “restart” when it should have gone on to unlocking Steve… Any suggestions? As far as Stan tasks glitching, do you go back in and he is just walking around? Or does the time not seem to sync up with the time actually left? The clear Roger task is no longer working for me. Roger is not reappearing and it’s been way over 4 hours. I won’t be able to win the challenge now. Any ideas? This has to be a glitch. Is Stan free? Or on a task? I ask due to I noticed in my game if Stan was busy, Roger would not respawn. But the second he completed the task…few seconds later Roger showed up. If this is not the case, please alert them. That may have been the issue. Roger is showing up again now. I should just barely get the reward. Any chance we can get a preview of the next task? Perhaps when it’ll start, how long we’ll have, what do we have to do to trigger it, that kind of thing? I ask because I’ll be out of pocket between Friday night and Sunday late afternoon without access to the game except maybe once per day. Problem is…TinyCo changes this up to the last minute before a launch, so we have no way of knowing accuracy until it hits the games live. Then we provide a full rundown of it all. So to provide what you are offering is impossible. Yeah…I thought so…just don’t want to miss out on something when I’m out of range. Just for looks mainly. 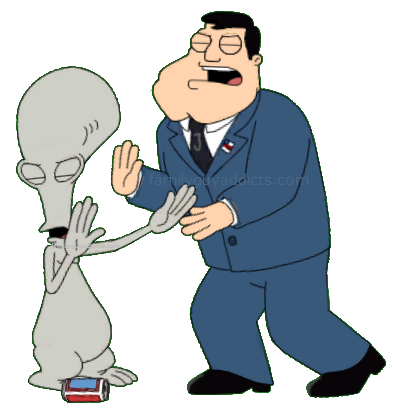 Something iconic from American Dad. I have a clear task list and I got the turd long ago. I need SOMETHING to do, I’m bored!!! This event is tooooooo slow!!!!!! Okay, I’m calming lol, I just wish they would hurry up! I just put eveyone on day long tasks, I don’t need money bc I have plenty with nothing to buy. 😦 i laughed at a couple Consuela tasks but I got over it, same with Stan. Heck, I even clicked on Roger a few times to hear him talk… I’M DYING HERE lol. 4 days=96 hours. (1 hr/task + 4 hr respawn) * 10 clears = 50 hrs, – 4 hrs because you won’t need him to respawn a tenth time =46 hrs. 96 possible hours – 46 task hours =50 hours to pay attention to. Now… assuming you pay close attention, this is nearly two days of paying attention. If you don’t set alarms, you have around 34 hours to play with. Plan a bathroom or lunch break cleverly, set alarms… this’ll be a breeze. Pretty much just understand that it’s not a good idea to take a quest for vacation once you start. Roger respawned a lot quicker than every 4 hrs. for me and I’ve seen other players have mentioned this. That’s why some of us already have the golden turd and didn’t have to use clams to speed up the task. This update now unpacks all my characters upon reopening the game. I store them so I don’t have to cycle through those that are capped and those that I need to level up. It was to prevent anyone else getting locked out of their games until the main patch is ready. The Make Roger Yours! 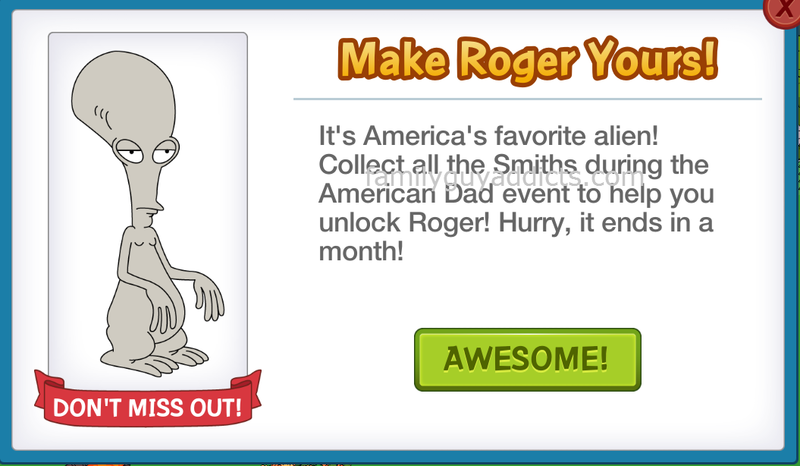 pop up says “Collect all the Smiths to ‘HELP’ you unlock Roger”, it doesn’t just say “to unlock Roger”. I plan on collecting all of the Smiths, but was wondering if there was some other way to get him or if this was just poor wording. Do you have any word from TinyCo on how to get Roger other than collecting all the Smiths and then get Roger free or what? I don’t mind Roger appearing earlier than the 4 hours. Heck it’s been only about 14 hours since I activated the challenge and without using clams to speed things up I am already at 5, so I have plenty of time. I like it…only mistake I made is put some characters on 24 tasks and now need them for Stan’s quests, but it’s only 1 day…plenty of time. Nice to have a relaxing event rather than the last couple where you feel like you have to check every hour rather than every few hours. Thanks for all the info! However, in order to get the Smith House, I need more clams. I’m trying to request as neighbors to get more clams. However, when I try to do this, a pop-up appears saying that I have the maximum limit of friends. This cannot be right, as I only have three friends. Is anyone else having this problem? Should I contact Tinyco? Any other suggestions? I would say contact TinyCo if you are having issues with Facebook link. So far, it looks like the 4 hours since clearing is a ruse. He seems to reappears at 2am, 6am, 10am, 2pm, 6pm, 10pm CT regardless of when you last cleared him. That is odd, he appeared every 4 for me outside twice he appeared at 2 hours. I know as I set Stan on a 4hr task in between them in the test town and just left him free in the other. I just got started last night, but am noticing this exact same spawn pattern. Every four hours (3, 7, 11 o’clock Eastern Time, which is the 12, 4, 8 rotation on the west coast). Most all of the game’s creatures that spawn periodically have a pattern like this. If you don’t see a Roger immediately upon getting in the game after one of these hours, give it a minute or two and he should appear. Just like minions, clowns, the nerds. They all spawn based on a computer code that has not changed much over the months. I concur with the schedule, but it is not characterized as a ruse. It’s a simplified explanation. So, after Roger appears, and let’s say you’re not playing when does appear, does he stay until you catch him? Or does disappear at the four hour mark when you’re not playing? Thanks. Well…it’s been 6 hours since I last bagged Roger, and he hasn’t shown up again. I’ll give him another hour before I call out the TinyCo CIA Team to find him. Is Stan on a task? I noticed at times in my game that if Stan was busy…there was a time he needed to be complete and as soon as I tapped that checkmark…the puff of smoke came and Roger was back. I’ll check that out…well…look at that. Roger’s back. When I took Stan off a task, the Hide Roger task didn’t appear right away. It’s there now, though. Thanks! Me too, I just finish the the task with both of them and then started Stan on a 4hrs task, 3 minutes into the task and I saw him walking around town. Now do u think he will appear if I don’t have Stan on a task? I had this as well, collected everything else but after nearly 2 days of constant task setting with Jerome, had just 3 photos. Then both Jerome and the barn started dropping them every time and this morning finally unlocked Stan. They started dropping consistently after I had powered off my ipad and all other items for him were complete. May be coincidence or may be the reboot reset something. Might be worth a try to power down your device just in case. Good luck! Still got 3 more items to unlock Stan. I could use 45 clams to complete him but I find no point in wasting 45 clams. I’d rather wait it out. I know, I know there is a special event out right now but really can’t Stewie continue his plutonium quest at the same time. Are we there yet Bunny? Are we there yet? How much longer do we have to wait? (Homer voice) Mmmmm animal crackers and juice box. The Smiths showed up on my Facespace page, but now the row with Predator, Alien, Jason and Freddy has disappeared. 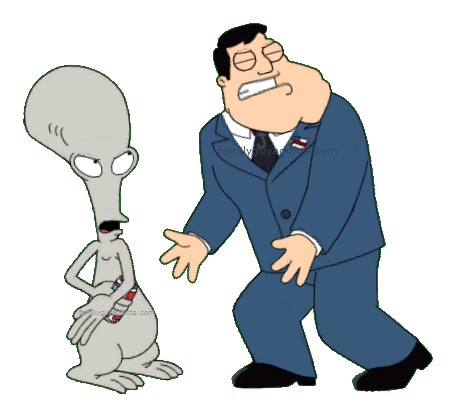 It would be great if there is an outdoor task with Roger and Alien. Also, the Pop and Lock task for Predator is hilarious, as is most of his outdoor tasks. Yah…they usually put the main stuff at the top. No worries, the rest will fall in place below eventually. They just set priorities on the events and actions themselves. I’m working on unlocking 3 characters, opened District 9 in the last few days of the Halloween event. So Tom Tucker, then Vinny arrived and now Stan. What fun!!! Just taking my time no stress… Have a Good Night!!! I just finished the barn this afternoon, so I only have a few things for him so far. I’m also in the middle of unlocking the news station/Tom. My nerd tower is looking funny. There are shadows in there. Was it recently animated or is that new? I think I remember Roger leaving a golden turd by an electricity power station, or something like that, and an utility worker found it in the bushes. Can anyone remember more times this turd made an appearance? And what was it Roger ate to produce the golden goody? Will I ever out grow toilet humor? Hmm I believe he ate really spicy burritos after he and Steve wanted to know what special abilities he had as an alien and had the runs which produced the turd which he didn’t notice was jewel encrusted gold and after the power station scene the worker showed it to a friend who got jealous and killed him for it. Racked with guilt the second worker drove his car into a train and died. Then an old cop found it at the suicide scene and took it home. Feeling guilty he took evidence from the scene he was going to return it but his wife poisoned him to sell the turd for money. After this I can’t remember if it came out again but I’m sure it has. Sorry if this was long but I basically grew up watching these shows and have a good long term memory. Have a good Night! How big is the turd ? (Never thought I’d say that!) but yeah ha.. How big is the turd once it’s placed ? Lol. I put the dimensions in the post. Height wise…hmmm…lil bigger than a brown dumpster. Bout same height as Port-a-Potty. Have not even come close to unlocking Stan yet. Will get there. I don’t suppose you know if any of the family will cost clams do you? I want to get the Smith house, but not at the expense of one of the characters I like. Nothing I can confirm. We will update when more info becomes available. I doubt it is just Dave feeling that. I had Bruce on a long task when the update dropped so it seemed like forever until I could build the barn. 2 days later I’m still waiting on about 6 items to unlock Stan, and I feel like i’m behind for some reason, even though I know I’ve more than enough time before Steve is released to get Stan and complete the first of the Roger missions. Please stop teasing the players that are stuck with the play area error. Btw, have you heard from your friends at TinyCo re:the fix for this glitch? 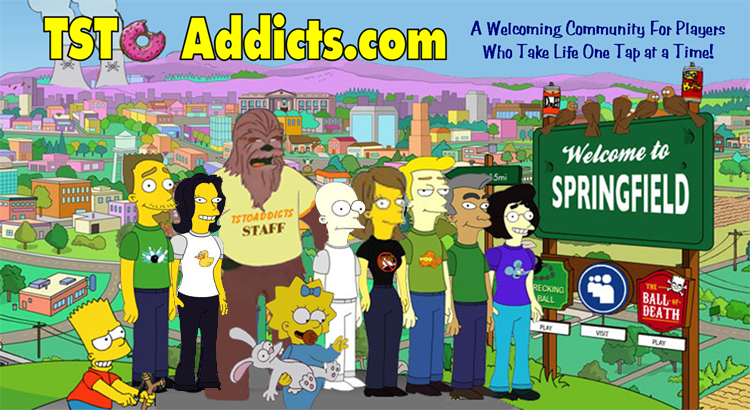 Thanks again for all you gals do for us addicts. They are working on it. No update as of yet.